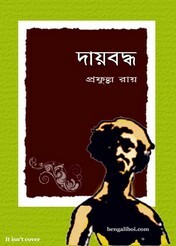 'Dayboddho' it is another great composition of famous writer Prafulla Roy. This author is one of the most remarkable writer of Bengalis language and one of West Bengal’s foremost contemporary authors. Prafulla babu is a very well-known writer to Bengali readers who was born on 11th September, 1934 in Atpara village of Bikrampur, Bangladesh. The first novel of his written was 'Purba Parbati' (1957). After then he wrote many novels and got many awards. His written important books are- 'Pratidhwani', 'Jagat Sansar', 'Mondo Meyer Upakhyan', 'Kinnari', 'Bhater Gandha', 'Manusher Juddha', Charachor', 'Sindhuparer Pakhi', 'Keyapatar Nowko', 'Uttal Samoyer Itikatha', 'Krantikal', 'Aditir Upakhyan', 'Joler Rekha' etc.